It's time for England and I'm happy that we have arrived! There are so many wonderful tidbits of England that it was difficult to choose so few. I visited several places trying to make sure about this next fun fact. I understand that there are more chickens than people in England. Okay, for those that don't know me, I am the crazy chicken lady so this tidbit had me smiling ear to ear. England is 74 times smaller than the USA, 59 times smaller than Australia and 3 times smaller than Japan. England is however 2.5 times more populous than Australia. One of England’s quaintest traditional events is the cheese rolling competition in Brockworth, Gloucestershire. The world’s first public street lighting with gas was installed in Pall Mall, London in 1807. In 1812, the London and Westminster Gas Light and Coke Company became the world’s first gas company. The oldest zoo in the world opened in England, in the city of London in 1828. Shoelaces were invented in England in 1790. I love tea whether it be hot or cold so it only made sense that the souvenir had to tea related. The process of making it is as important as drinking it to me. For the past several years, I have been a student of tea and have loved learning how different types of tea are made and where they are made. Did you know that half of the world now drinks tea! If you would enjoy learning more, go HERE. Another fun thing about the Tea Journey folks is that they have a JoJo Club! Now how fun is that. I felt so special seeing my name that I may have to join and get custom teas delivered to my home each month! I learned about the magazine from a Kickstarter campaign that I participated in. I can hardly wait until the summer of 2017 to get my special, smart tea brewer. 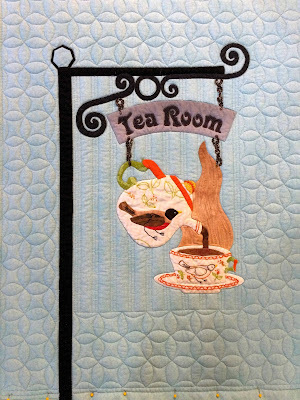 Now, can't you just picture yourself walking down a path and seeing the Tea Room sign beckoning you to come in out of the cold for a nice, soothing cup of hot tea! Ole England how I desire to someday visit you in person.